MackinVIA™ is a program that makes it easy to access your school’s digital resources. You can use MackinVIA on any desktop, laptop, or mobile device with Internet access. 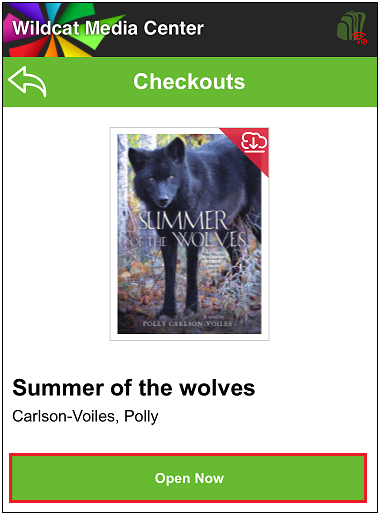 If you would like to download titles to read offline, our free MackinVIA app  is available for all major mobile devices. Please see Supported Platforms and Devices  for more information. 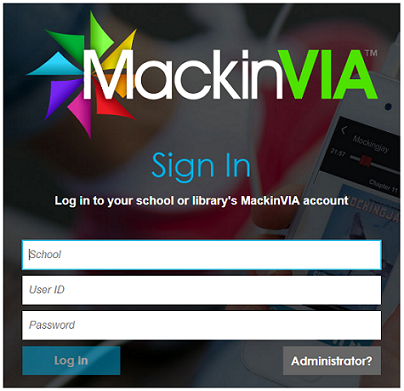 Log into MackinVIA to view and interact with the digital resources owned by your school. Your teacher or librarian will provide you with a User ID and Password. Go to https://www.mackinvia.com  from any supported browser. In the School field, begin typing your school’s name and then select it from the dropdown menu. 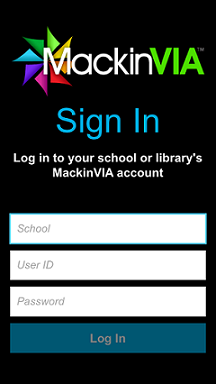 Open the MackinVIA app on your device. IMPORTANT: Please do not share your User ID and Password. 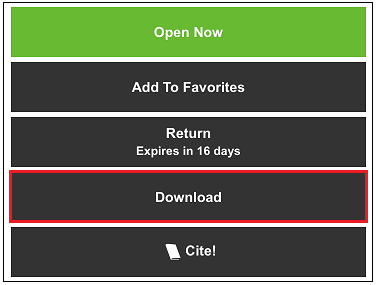 Only your school has the license to access digital resources with this login information. Thank you for your cooperation. 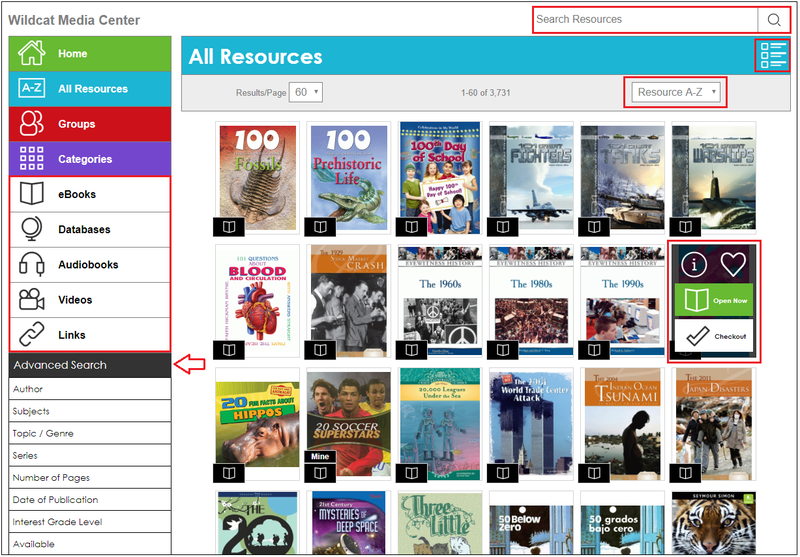 There are several ways to search for digital resources  in your school’s MackinVIA. Use the one that works best for you. Keyword Search: Type a word or phrase in the search box. Click the search button or press Enter. Advanced Search: Select one or more filters from the Advanced Search menu to narrow your search. Resource Type: Select eBooks, Databases, Audiobooks, Videos, or Links. Click All Resources to browse through all of the resources owned by your school. Groups: Click on a Group  to view a collection of resources created by your teacher or librarian. Categories: Click on a Category  to browse through resources about a certain subject. Home: Scroll through carousels of newest, top, or highest rated resources, any featured Groups or Categories, and articles from DOGOnews. While browsing, you can choose to sort the resources by title, author, newest, or highest rated. If you are logged into your Backpack, you can also change the view of your resources by toggling between List or Tile view. Once you find a resource, click Open Now to read it, Add to Favorites (or the Heart icon) to save it for later, or Checkout to borrow it. If the resource is currently “Out”, click Request to be placed on a waiting list. You also have the option to Preview it. 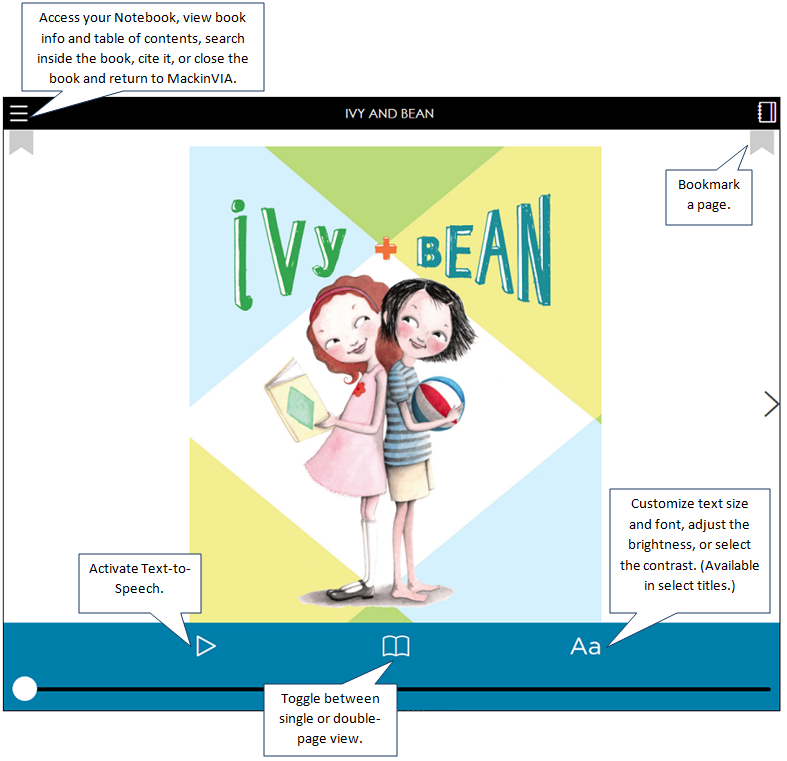 In select eBooks, you will also have the ability to customize text size and font, utilize text-to-speech, or adjust brightness and contrast. Please note: Only Mackin-hosted resources are viewable and/or downloadable in the MackinVIA Reader. Your school may own digital resources hosted on other platforms as well. 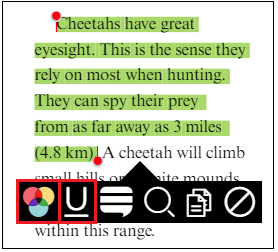 To create a note about text in a resource, you must first highlight it. Select the text by clicking and dragging the cursor or Text Selection Pins (or tap/hold on a mobile device). Click on the highlighted text to bring up the Options menu. When the menu appears, select the Highlight Color button or Underline button. After you’ve selected the word/text, click/tap the Note button. Type your note and click the Save button. To access these features, click on the Backpack icon located next to your name. The Favorites  feature allows you to view saved resources. You can open, remove from favorites, or check out titles from this page. The Notebook  feature allows you to access all of your notes and highlights, even from resources that are no longer checked out to you. You can add, edit, and delete notes from this page. 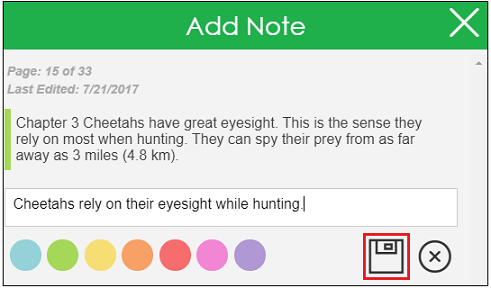 The Add General Note option allows you to add notes to your Notebook that are not associated with highlighted text. You also have the option to print your notes or export them to Google Drive or OneDrive. Additionally, you can search your notes by keyword or filter them by color, date, or resource. 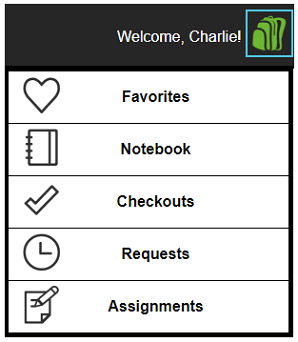 The Checkouts feature allows you to view your currently checked out resources. You can open, return, or renew titles from this page. The Requests feature allows you to view your requested resources (titles currently in use by someone else). When a title becomes available, it will be placed on hold and you can check it out from this page. 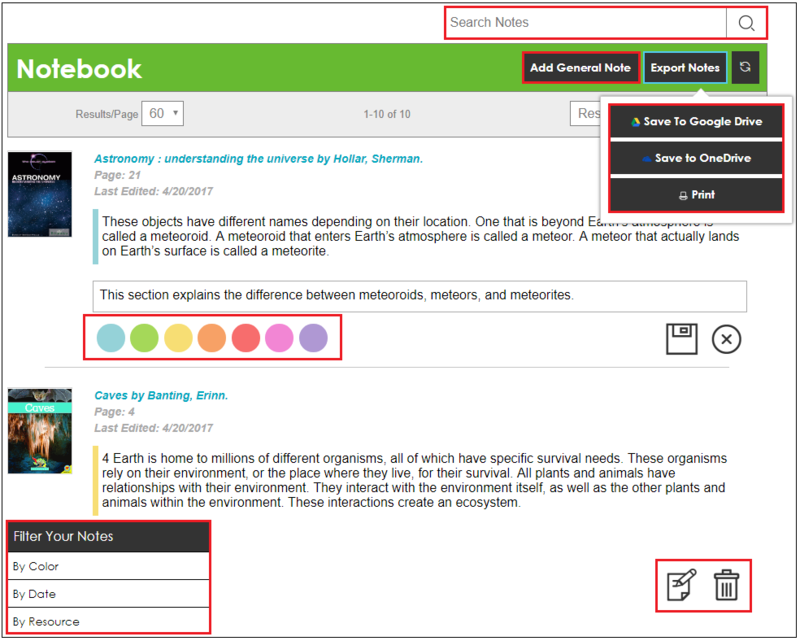 The Assignments feature allows you to access resources assigned by your teacher or librarian. You will be provided with an assignment code by your teacher or librarian. Enter the code and the assigned title will populate on this page. The title will remain locked until the assignment becomes active and will automatically be returned at the end of the assignment period. Open the MackinVIA app on your device and log into your Backpack. Please note: The download process requires internet access. Once a title is downloaded, it will be available for reading offline. Please remain logged into your Backpack prior to going offline. Copyright © 2015 MackinVIA Help. All rights reserved.